Relatives of seven men arrested over an alleged plot to blow up the Sears Tower in Chicago and attack FBI offices have been protesting the group's innocence. Marlene Phanor, sister of one of the accused, said they have been unfairly dubbed terrorists and that they were victims of US scaremongering. According to the charges, the men, five from the US and two from Haiti, hoped to wage a "full ground war" on the US. Officials said the men were foiled at an early stage and posed no danger. US Attorney-General Alberto Gonzales said the group of "home-grown terrorists" were inspired by "a violent jihadist message". "They were persons who for whatever reason came to view their home country as the enemy," he told reporters. 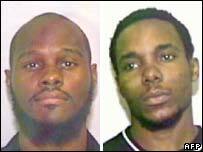 A federal indictment says they were conspiring to "levy war against the United States". According to charges brought against the men, the group, aged 22 to 32, had sworn allegiance to al-Qaeda, but had no contacts with it. They have been charged with conspiring to blow up both the Sears Tower and the FBI building in North Miami Beach. Mr Gonzales said the lack of direct link to al-Qaeda did not make the group any less dangerous. "Today terrorist threats come from a smaller, more loosely defined cells not affiliated to al-Qaeda," he said. "Left unchecked these home-grown terrorists may prove as dangerous as groups like al-Qaeda." However, Ms Phanor, sister of Stanley Grant Phanor, one of those arrested, denied that her brother had any terror links. "They're labelling him something that he's not," she told Miami's WSVN TV station. "He's... no terrorist; he's in a religious group that's trying to support the community." "It's all a show, they're scaring people, there's nothing to be scared at all," Ms Phanor told the AFP news agency. 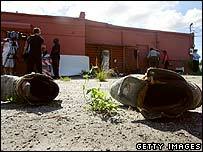 Neighbours in Miami's poor Liberty City area said the men apparently slept in the warehouse where they were arrested. "They would come out late at night and exercise. It seemed like a military boot camp they were working on there. They would come out and stand guard," said Tashawn Rose. However a man claiming links to the arrested men told the news channel CNN that they were a peaceful religious group who studied Islam at the warehouse. Five of those charged appeared at a Miami federal court on Friday. They wore ankle chains and were chained together at the wrists, the Associated Press reported. Alleged ringleader Narseal Batiste apparently asked an undercover agent he thought was from al-Qaeda for help to build an "army to wage jihad", the indictment said. He is said to have told the agent he and his "soldiers" wanted al-Qaeda training and planning for a "full ground war" against the US in order to "kill all the devils we can". His mission would "be just as good or greater than 9/11", Mr Batiste said, according to the indictment. No weapons were found in the Miami warehouse, and the seven had not posed any immediate danger, the FBI said.